FFI, just try to include a picture when your 203 comes in I love G&P stuff - Can't wait to see the trades. thats what i was planning to do, i wa sjust super excited and posted. I ordered the KAC version with QD mount. now i just need to find shells. These always remind me of a Zealot's head for some reason. Idon'tgetit. Need to paint it by Saturday! I thought the same thing, honestly. It's getting a helmet cover tomorrow. I would never dare paint this beast. They look too good as is. Phil, what is the idea behind the design? From my understanding it was to allow heat venting. I don't understand all the intricacies of the design 100% just yet. However, It's EASILY the lightest ballistic helmet on the market right now, offering 20% better ballistic impact rating, as much surface area protection as a MICH 2002 while being 20% lighter than the 2002. Pretty incredible really. So how long before we see these knockoff on the market? Probably a week or two haha. Blade, it's actually two pieces of kevlar bolted together. They over lap about an inch, but at the "crown" of the helmet have a small gap which air can pass through. Red, for once I did pay retail. People are paying EVEN MORE for them used!!! Last edited by Phil; 08-03-2011 at 01:25 PM. Any plans for Ears or Chops? Get the chops, It looks like a mandalorian helmet with them. You have to get the chops, just saying. I would leave it as it is. The chops just make it look...stupid. Nice bit of kit you have there Phil. Jury is still out on Chops. Probably won't get ears. SFLCS SAW pouch, KAC BUIS (Possibly issued), and a kill flash. All bought for under $20! Last edited by Italian; 08-05-2011 at 07:38 PM. Best fitting helmet cover I have ever seen. Also coolest one. $12 and change was just too god of a deal to pass up. I needed a new tube for my S System after rewiring the gearbox to the rear. I also moved my AGM Crane stock to the S System. It is a standard 6 position stock tube with cut-outs at the rear for Crane style batteries. The AGM Crane stock was a snug fit, but works much better than the stock AGM tube. Something worth mentioning is the included bolt will only fit a metal body with the short stock tube such as those found on G&P M4 bodies or bodies trimmed to fit a Mk18 Crane or HK416 stubby stock. This has already become the trend with many metal bodies. If you need it to fit, have a hacksaw handy if your body has the longer stock tube adapter. Pick up a Rhino PVS-14 for 5$ (ISSUED) Best buy. Best 51$ i have spent. I bought a set of Weaver Quad lock 1" scope rings. The rings have crossbolts that fit my 40mm Red dot. 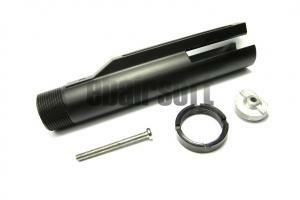 If you lose the mount crossbolt or parts from your Tasco or BSA 25-40mm Red Dot, this is an inexpensive replacement.